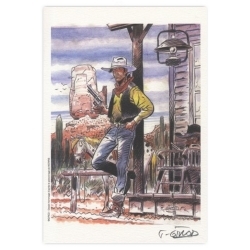 Ex-libris Offset Tribute from Thierry Girod to Lucky Luke (colour version). Dimensions: 21x14,5cm. 250 numbered copies signed by the author. 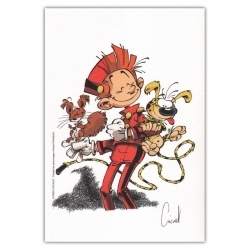 Ex-libris Offset Tribute to Franquin Gaston Lagaffe, Altron (21x14,5cm). 250 numbered copies signed by the author. 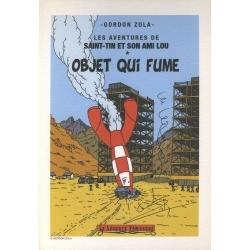 Ex-libris Offset Tribute to Tintin Gordon Zola Objet qui fume, Les aventures de Saint-Tin et son ami Lou. Dimensions: 14,5x21cm. 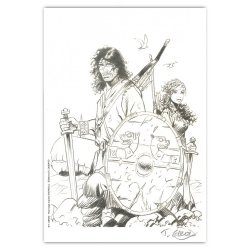 Ex-libris Offset Tribute from Thierry Girod to Thorgal (Black and White version). Dimensions: 14,5x21cm. 250 numbered copies signed by the author. 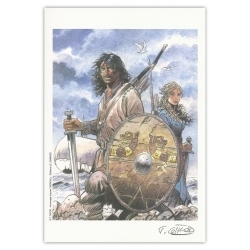 Ex-libris Offset Tribute from Thierry Girod to Thorgal (colour version). Dimensions: 14,5x21cm. 250 numbered copies signed by the author. 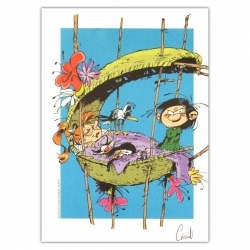 Ex-libris Offset Tribute to Franquin Gaston Lagaffe, Coicault. Dimensions: 14,5x21cm. 250 numbered copies signed by the author.